You do know who The Ballas Hough Band boys are - don't you?! 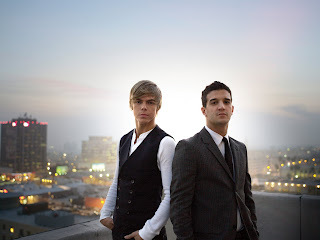 You know, Derek Hough, who won the most recent Dancing with the Stars (DWTS), and Mark Ballas, who won last season? Yeah... that's them. I guess now is a good time to admit that I also don't watch Dancing with the Stars. It's just not my thing. shhh...don't tell anyone! Or it was not my thing. I gave up on Reality Shows (unless they're on HGTV) way back after the 1st season of Survivor ended. They just started getting on my nerves. So when One 2 One Network sent me this CD to review, I didn't expect much. Boy, was I wrong! The lyrics of the songs on this CD, combined with the music - BRAVO! I especially liked "Do It For You" (which was co-written by new "American Idol" judge Kara DioGuardi), and "Breakthrough". Even "She Was the One" had me reminiscing! Add to it that the boys are quite handsome, and you have yourselves a winning group! Be sure to check out Their Official Website. Also - head over to Amazon to preview songs off of their album or to buy it! I promise you won't be disappointed, just like I wasn't! Thank you One 2 One Network for letting me learn about a different band!